A robust blend of premium Nicaraguan and Dominican tobaccos covered in a dark brown Connecticut Broadleaf wrapper, complete this magnificent Churchill. When paired with your favorite libation, the rich spicy flavors of the Charlemagne make for an incredible evening. Packaged in a box of 25. I am not the biggest fan of Gloria as there is often an overtone of "nutty"- kind of like Romeo's which is not to my taste. The construction of La Gloria is always good but this particular one is excellent. A very dark Ecuador Broadleaf binder is tasty and provides a complex taste with the lighter filler. Not as strong as you'd guess- but more than medium and this size will last all evening with very few touchups required. This is one of my favorite cigars. Everything about this stick was spot on. From the draw to the shape edge. These are a must try for the newer smoker that is looking to break into a stronger blend and a darker side to cigar smoking. Deep, rich flavor from this LGC. I don’t usually pick cigars this long, but a great choice for after a big meal with plenty of time to enjoy. 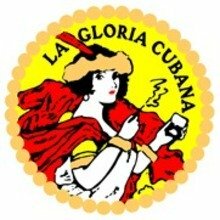 This La Gloria Cubana is a mediocre stick with kind of a bland flavor. Definitely not one of my favorites. Ok burn and smoke output. Flavor is spicy, leathery tobacco. 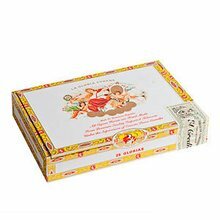 Ok after dinner party smoke if you want something cheaper. I don't know if it was just a bad stick since I have only had one of these, but the flavor was not good at all. I made sure to let it rest for a good time, but I was very disappointed with the flavors when I decided to light it up. The burn and construction where very very good, just the flavor was off for me and not really enjoyable. Extremely tasty. Complex but not harsh. Consistent from toe to head. I will definitely put these in the humidor. Love thi cigar, priced right lots of smoke and steadily available .picked up a box last month. You should have at least a fiver in your humidor. 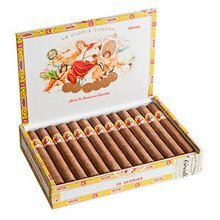 Great tasting cigar as all the la gloria's are, very flavorful with a myriad of tastes coming thru. Good cigar when you have time for a quite enjoyable smoke. Great smoke! Smooth sailing and great price. Get you some! You can't beat Jr's prices and availability.